Acetate is one of the most versatile materials that us crafters get to play with. 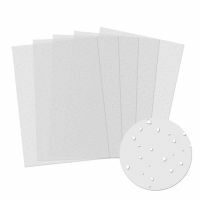 Perfect for use with card apertures, it is also ideal for card wraps, rubber stamping, creating windows in your cards and more. Pack contains 5 sheets of luxury acetatewith a white, foiled snowfall design to add a wintery touch to your cards.